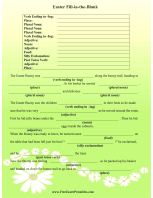 This printable letter from the Easter Bunny thanks the recipient for participating in the community Easter Egg hunt. Happy Easter! Thanks so much for coming out to the community egg hunt! 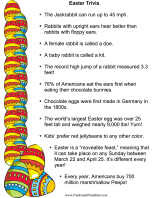 It's such a fun tradition, and the folks who put it on love seeing the look on kids' faces as they discover the eggs. I hope you found a nice amount of eggs! I'm proud of how gentle and patient you are with the smaller kids. And You are so clever - it's hard to hide eggs that you can't find. Well, I am exhausted! Not only do I have eggs and Easter baskets to deliver on Easter Day, but I need to plan for the hunts in cities and towns all over the world. I love it, though. I'm going to hop off down the Bunny Trail, back to my workshop. Please enjoy your treats and Easter dinner and have a special day with your family. I'll be back next year!